Available as low as $23.75 per oz over spot! Some investors prefer the highly refined appearance and decadent designs featured on many gold and silver precious metal bars produced today. Others prefer a more rustic, or traditional, appearance to the products they invest in. 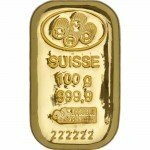 For those who prefer the latter, the 500 Gram Gold PAMP Suisse Cast Bar is available right now from Silver.com. Consists of 500 Grams (16.075 troy ounces) of .9999 fine gold. Features a rustic appearance with rounded edges. Deeply-mirrored finish on the surface. Individual bars available in sealed packaging with Assay certificate. The finest gold and silver bars in the world are produced at the refinery at PAMP Suisse. Products struck and cast at the Swiss refinery are well-known for high quality and impressive levels of purity, with PAMP Suisse considered by many as the leading bullion brand in the world. 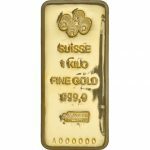 All products from PAMP Suisse, such as the 500 Gram Gold PAMP Suisse Cast Bar, are individually numbered and guaranteed by the refinery to contain the exact weight and purity of gold advertised on the bar. Additionally, every product from the refinery is independently certified by the Swiss Federal Bureau for the Control of Precious Metals. On the reverse face of this gold bar you’ll find only a blank, smooth surface that has a deeply-mirrored appearance. The outer edges of the bar are rounded and smooth. The obverse side of each of these bars has all the important characteristics investors and collectors are looking for in a precious metal product. 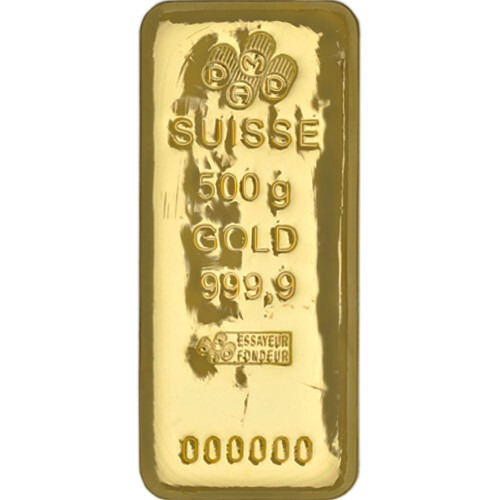 The obverse of the 500 Gram Gold PAMP Suisse Cast Bar features the PAMP Suisse corporate logo at the top, followed immediately below by the weight, metal content, and purity of the bar. Along the bottom of the bar are the engravings of the assayer’s mark and the individual serial number. Founded in 1977 in Ticino, Switzerland, PAMP Suisse is far from one of the world’s oldest refineries. However, its dedication to quality and state-of-the-art facilities have established it as a leader in the precious metals industry. Today it is part of the global MKS Group, a financial services and precious metals leader. If you have any questions, a Silver.com associate is available at 888-989-7223 to help answer those inquiries. You can also reach our team members online through our live chat service and via email. If you are interested in similar products, be sure to check out our full selection of Gold Bars.